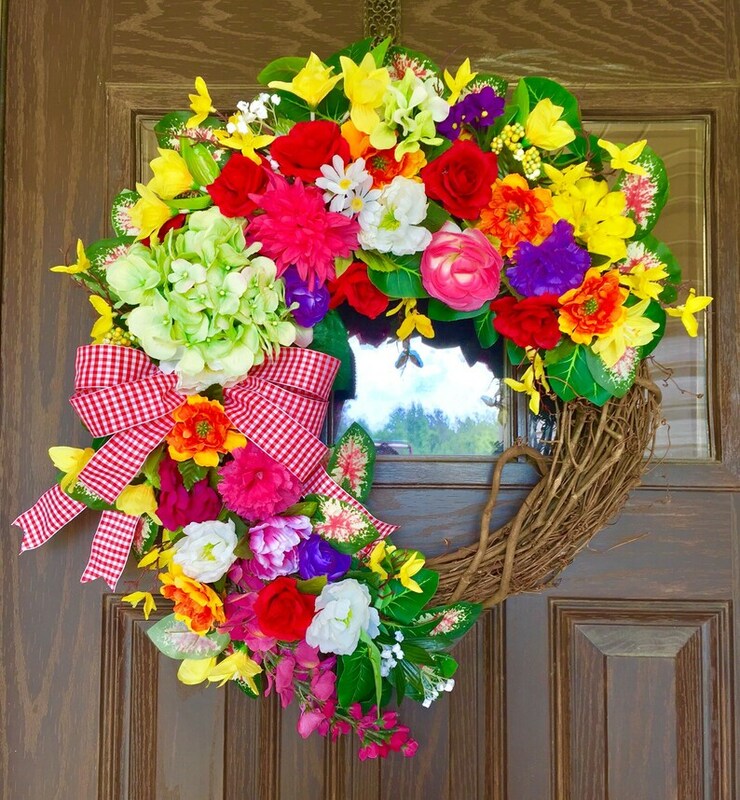 View other wreaths and cemetery flowers at https://www.etsy.com/your/shops/WreathsByTrina. The collection of wreaths, saddles and vases are designed with a colorful array of deco mesh, fabric, ribbons, metal, flex tubing, chenille stems, artificial flowers, glitter, glue and/or other decorative accessories. Handle and wipe wreaths, saddles and vases clean with care. View collection of wreaths, saddles and vases for other color options. Wreaths, saddles and vases are handmade in the USA. Wreaths are 22 to 24 inches wide. Large wreaths are to 24 to 26 inches wide. Wreath, saddle and vase arrangements may vary depending upon the availability of materials and supplies. Wreaths weigh up to 5 -7 pounds after packaging. USPS (United States Postal Service) as primary carrier. Signature confirmation may be required. Thank you for allowing my art into your home! The wreath is as described and fast shipping but described as a cemetery wreath and pictured on cemetery stand but there was not a stand included! Had to purchase separate. Would have ordered elsewhere if I had known. The Etsy title and description did not include mention of a wreath stand as part of the item for sale. The stand was only included in the picture in order to fully display what the wreath would look like on an easel. Likewise, wreath door hangers are typically not included in wreath descriptions or purchased wreaths when shipped to buyers. If the buyer had contacted the seller prior to purchasing the wreath, the seller would have explained that the stand was not included but would have included it for a small additional charge. See description details for sizing information. Over time, items may require dusting.